If you asked me even a couple months ago if I'd ever do a Whole 30, I would have said absolutely not. I mean, I'm not a stranger to clean eating and even juice cleanses (read here about the one I did in 2014), but I love food. Looooove food. And I like my food to taste delicious. So I was not keen on the idea of cutting out crackers and cheese (or wine for that matter) for a whole month. Buuuuut, I just couldn't deny all the fabulous claims that the Whole 30ers were claiming. The best sleep in their entire life! Boatloads of energy! Feeling better than ever! What finally convinced me was talking to my cousin while we were out in California. She did one and had phenomenal results. 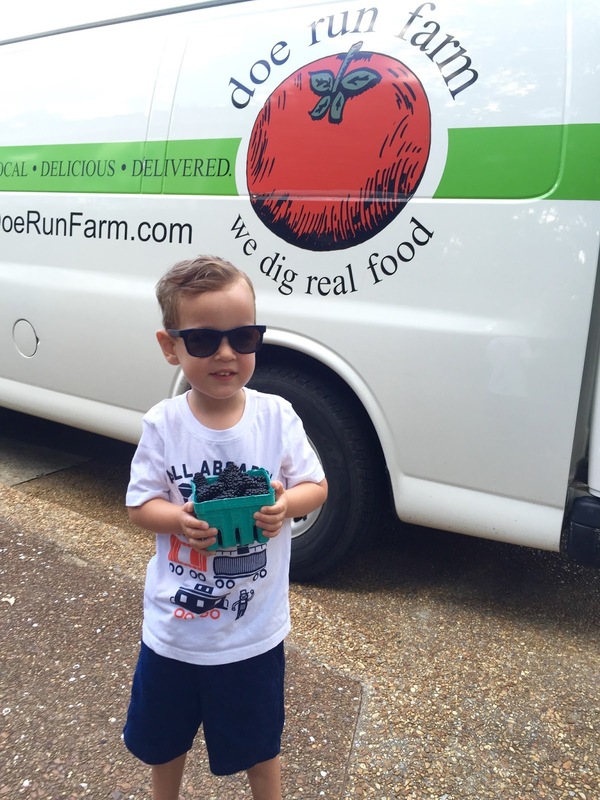 So, the day after our cross-country flights back to Alabama, I embarked on my Whole 30 journey. If you don't know a ton about Whole 30, the premise is that food affects everything - and certain foods have a negative effect. Makes sense, right? It advocates for whole foods versus processed foods. If you've read here before, you know I cringe at the word "healthy" as it's super relative and (I feel) overused in labeling foods. Case in point, there are entire eating programs comprised solely of foods restricted from other programs. Everyone has their own idea of healthy, however, trading processed foods like chips for whole foods like vegetables is an idea I don't think anyone would argue. So, what foods does the Whole 30 say promote negative things? Dairy, legumes, grains, and additives/fillers. Plus alcohol. Rest in peace quesadillas and ice cream cones. See ya, Happy Hour. At least until July. So, what have I been eating? 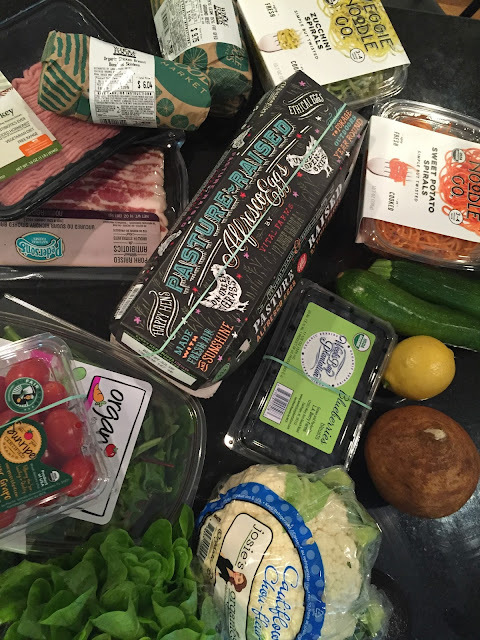 Whole 30 advises plates filled with grass fed, pastured animal protein, a ton of (organic when possible) veggies, and fats from foods like olives, coconuts and avocados. And the kicker? No added sugar. Zero. Not even honey. I prepped for my Whole 30 by reading lots online (there's also a big community on Instagram). I also found both books at my local library because I so much prefer printed pages to screens. The first book, It Starts With Food , really goes into the how and why behind the program (and answered the questions in my mind like Why are peanuts and garbanzo beans off limits? and Why can't I just pick up any ol' almond milk?). 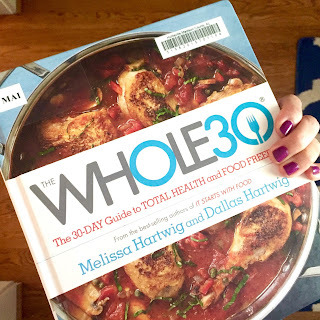 The second and most recent book, The Whole 30, includes a good bit of the rational but is mostly comprised of recipes with gorgeous color photos. This is the one I most enjoyed having in print so I could tote it into the kitchen and cook with it open. And this brings me to the food! I must say that summer has proved to be the most natural time to do this. Our CSA is providing tons of fresh, local produce each week and our garden is full of herbs to top all the dishes - win, win. 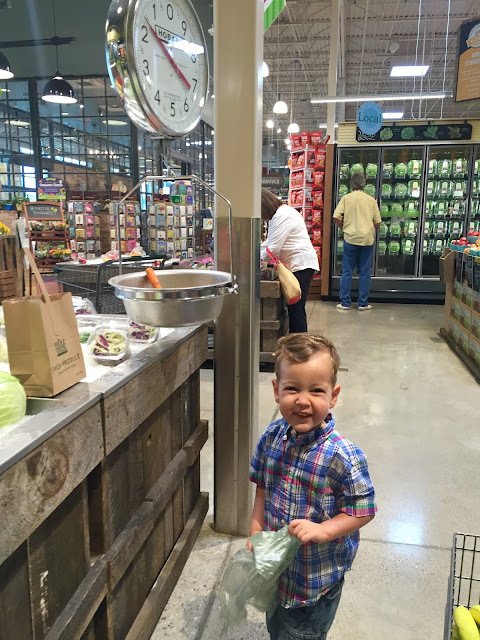 Whole Foods has filled in the rest (my helper never turns down a trip there since they have mini carts, which he thinks are the best things ever, after the produce scales of course). My first day on the program was also our first day back in town. Not the smartest decision on my part because I woke up to an empty refrigerator. 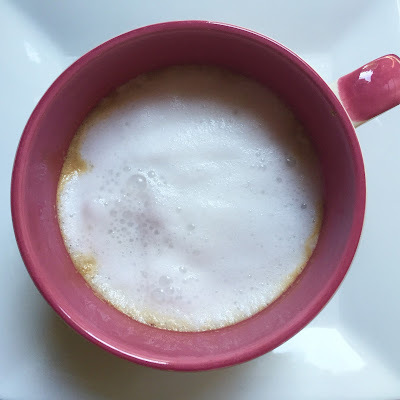 I started the day with coffee and coconut oil... yep, you read that right! Since dairy was off-limits, I whisked in some coconut oil (which was a Whole 30 recommendation). Overall, not bad and my lips were oh so soft from drinking it! Not gonna lie though, a bit strange, so I knew I would be hunting for compliant almond milk (most almond milk contains carageenan, a filler not allowed on Whole 30). Parker and I hightailed it to Whole Foods first thing and stocked up on meat, fruits, veggies, pastured eggs, freshly ground almond butter and New Barn almond milk. My first Whole 30 meal (a late breakfast) was spiralized sweet potato sautéed with garlic and tomato, topped with fried eggs and garden basil, and a side of avocado. And I totally had a tummy ache afterwards (they say this is the "carb flu" when you are detoxing from grains - it usually comes after day two or three, but apparently I'm just gifted). I made the Whole 30 "Monkey Salad" for lunch/snack (chopped banana and raisins, topped with shredded coconut and cinnamon with a side of freshly ground almond butter) and dinner was mashed potatoes (made with ghee and compliant almond milk) topped with crispy prosciutto and chives. I realized I wasn't getting nearly the amount of veggies as prescribed, so I made a mental note to try better the next day. Combine ingredients in a food processor and puree for 2-3 minutes until creamy. Top with shredded raw unsweetened cacao nibs, sliced banana and unsweetened coconut. Enjoy! For my morning coffee, I ended up switching from the coconut oil to almond milk. I usually just steal some of Parker's organic whole milk for my coffee (or use cream if we have it on hand), and while the taste is not the same, the almond milk is doing the job. As a bonus, it froths very well! I loved topping my coffee with a bit of foam! Lunch is always a hard meal since I'm busy tending to a three-year-old and acting as a short order cook for him. Since all of his favorites are no-gos for me right now (grilled cheese, peanut butter and honey sandwiches, chicken tenders, quesadillas) it's helped to make batches of creamy salads that I can have for a couple days. The dressing for the Potato and Chicken salads above is directly from the Whole 30 Book: 1/4 cup of mayo, 2 Tablespoons Lemon Juice, salt and freshly ground pepper. I double or triple it and get creative (grapes with the chicken, olives with the potatoes). Dinner has actually been the easiest of all the meals (and I was anticipating it would be the most difficult!). As a stay-at-home mom and wife, I cook dinner daily for both my boys, and I had envisioned myself having to make two separate meals each night, one for me and one for them. This really hasn't been the case - everything on the Whole 30 is fresh and nutrient dense, food I would be happy to have my boys eat. Since they are used to getting a grain, it's an easy thing to add or swap in. For example, I served them french bread with the steak dinner, and ladled their Spaghetti Sauce over pasta instead of squash. I'm currently on Day 11, which is labeled along with 10 as the hardest days. So wish me luck! I'm already feeling great, and sleeping so deeply. Like, ridiculously deep sleep. And I feel like I have more energy, but it might just be the change in season (since we do so much more in the summer versus winter when it gets dark so early). Are there any other Whole 30ers out there?? Great post! I have heard so much about this. I can't wait to see how you feel after 30! If you ask my doctor, my blood type is not A+ but rather wi-che....for wine + cheese haha! As for the foods and not having grains, that would be no issue for me, and we don't do regular milk, and I think I could go with out the cheese, its the wine that just.might.kill.me :) Good luck making it through the "hard days" and I can't wait to hear about it all when its over! OMG! You have sold me on this WHOLE 30 thing now! I swear you make me want to try everything you are doing or eating. I think I might try this! One of my friends is doing this, and I am intrigued. Can't wait to hear more about how you think of it once it is done!